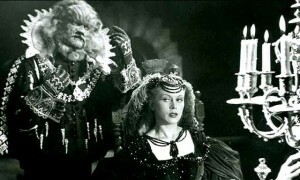 Jean Marais (l.) and Josette Day are Avenant and Belle in Cocteau's Beauty and the Beast. The Criterion Collection issued a Blu-ray edition of Jean Cocteau’s sublime 1946 film adaptation of the fairy-tale masterpiece Beauty and the Beast on July 19, 2011, for a list price of $39.95. Cocteau’s landmark movie fantasy, in which the true love of a beautiful girl melts the heart of a feral but gentle beast, features unforgettably romantic performances by Jean Marais (Orpheus) and Josette Day (Les parents terribles). The spectacular visions of enchantment, desire and death in Beauty and the Beast (La Belle et la Bête) remain timeless. Criterion released a DVD edition of Beauty and the Beast in 2003, which is still available for the suggested retail price of $39.95. But this Blu-ray is no doubt an upgrade. Presented in French with English subtitles, the Blu-ray edition has a high-definition digital transfer from restored film elements and an uncompressed monaural soundtrack.